A dedication service has been held at the much-delayed Spinnaker Tower in Portsmouth ahead of its official opening on Tuesday. The ceremony to bless the troubled tower was held on Sunday, just days after its operators finally announced it was to open. That opening comes five years late and sees the tower massively over budget, at a cost of £35.6m. MP Mike Hancock has labelled it an "icon to municipal incompetence". The Liberal Democrat MP for Portsmouth South, who is a city councillor, said: "It is a wonderful structure with a magnificent view and I am full of admiration for it. "But it is an icon of municipal incompetence and blundering. It should never have been built in the first place." The tower was not intended to cost local council taxpayers anything. But so far Portsmouth City Council has paid £11.1m towards the construction. 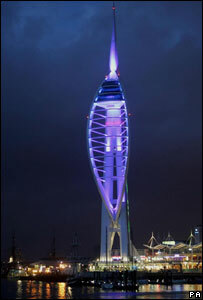 Roger Ching, strategic director for corporate resources at Portsmouth City Council, said: "We are over budget and, yes, the tower is late, but now we have this fantastic tower structure. "The view from the top is totally awesome and it is amazing to see the postage stamp of a site that this huge structure has been built on."